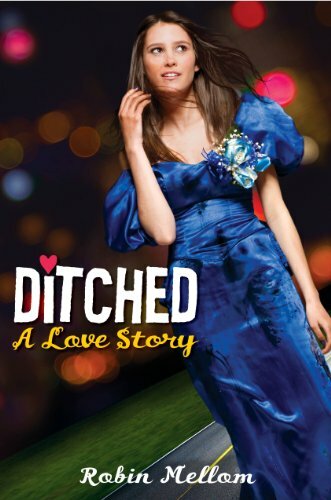 Ditched seemed cute, but it is actually more lighthearted than I expected. It reminded me a lot of the classics—Pretty in Pink, Sixteen Candles, The Breakfast Club etc. It has that fast paced, silly charm that those movies have, and it was a lot of fun to read. The only thing I didn’t enjoy was the main character, and I think if she had been a bit different, I would have liked it a lot more. Justina didn’t seem consistent. She’s a girl who didn’t even want to attend prom and dresses in all black every single day, and yet she loves daisies, worried what everyone thought of her, and had locked lips with half of the boys in her school. She was difficult to imagine because all of the things didn’t seem to add up. She also made excuse after excuse for her actions, saying everything was “an accident”, and her unwillingness to own up to the things she did annoyed me to no end. Ian was adorable (although a little too perfect to seem real) and I wish we had seen a whole lot more of him. I also loved the women she was telling her story too, and the chapters in which they’re giving Justina advice were my favorites parts of the story. I think the author did a great job with the way she told the story. Despite the fact that I didn’t care for Justina, I wanted to know what happened next. I wanted to see what other shenanigans Justina managed to get herself into in the span of one evening. It was a lot of fun to read and perfectly paced. I think it’s supposed to be fun and quirky, and it accomplishes that. I’d recommend it if you’re in the mood for a very lighthearted read. I was wondering if this one was any good. Sounds promising with a bit of an odd protagonist. Great review Amanda! Awesome review! Although you gave it a three out of five, I still think I want to go out and buy it. It seems like a book that I would definitely like. I love Pretty In Pink, Sixteen Candles, and The Breakfast Club so that alone makes me want to read Ditched. Thanks for your honest review. I enjoyed reading your review. I really loved it, and can still see where you are coming from in your review. Thanks for taking the time to write up the review! I've got to go grab this one up!